This is two of a four part series. I will link each current diary to the preceding one. I’m also giving an original song to listen to while reading. I wrote it over a period of roughly two years about Wounded Knee. Feel free to download it and put it to good use. Topics covered in this four part series are: prior events and circumstances that led up to the Wounded Knee Massacre, Wovoka and the influence of Jesus Christ’s teachings in Wovoka’s instructions to the Ghost Dancers, the innocent role of the Ghost Dance and Ghost Dancers in the Massacre, The Dawes Act and similar governmental policies, the Wounded Knee Massacre itself, some philosophical thoughts, and conclusions. While I must speak of two religions by necessity due to the nature of the historical context, I am endorsing neither. I’ve wondered if it was best for Chief Big Foot and his people to not fight. Would it have made things better for them, or worse? Remember that Wovoka began the Ghost Dance, and Big Foot and his people were Ghost Dancers. and the policy of extermination may have been carried out so much further, so that the barest recovering of their culture in the future would not have been possible. There are certain factors leading me to think that Wovoka’s instructions mirroring Christ’s teachings about “turning the other cheek,” made it possible for their culture to begin reviving in the very distant future. It makes it easier to understand this being more likely, if you know that major decisions for the people are made while considering the consequences to the future 7th generation. Indian Affairs, Bureau of, created (1824) in the U.S. War Dept. and transferred (1849) to the U.S. Dept. of the Interior. The War Dept. managed Native American affairs after 1789, but a separate bureau was not set up for many years. It had jurisdiction over trade with Native Americans, their removal to the West, their protection from exploitation, and their concentration on reservations. It is my opinion that Wovoka’s urging no retaliation is what saved the Sioux’s complete cultural annihilation, and made its resurgence possible in the future. Opportunities to stop the European encroachment were lost in the beginning. Louis and Clark’s Expedition was one such later opportunity, but would defending their lives and way of life with force have stopped the European encroachment? It may have bought them time, or gave them less time than they already had. A sound conclusion is impossible, I think. However, since Europeans had superior technology and brought the diseases that killed 90% to 95% of the total indigenous population; I lean towards saying it was inevitable. The only way the death and destruction might have been possibly avoided or postponed, is if Christopher Columbus had perished in the Atlantic on February 14, 1493. Or, that no violent and conquesting Europeans ever discovered the Americas, which seems quite unrealistic to me, however ironic. Why didn’t the white Europeans emulate the Vikings? I always thought Vikings were more violent than Puritans were when I was growing up… didn’t you? The first European to land in America was Leif Ericson, a Viking seaman from Greenland (see Ericson). The ancient sagas give different accounts of this voyage made in the year 1000. Leif landed on a forested shore, which he called Vinland. He did not realize he had found a new continent, and Europe heard nothing of his discovery. 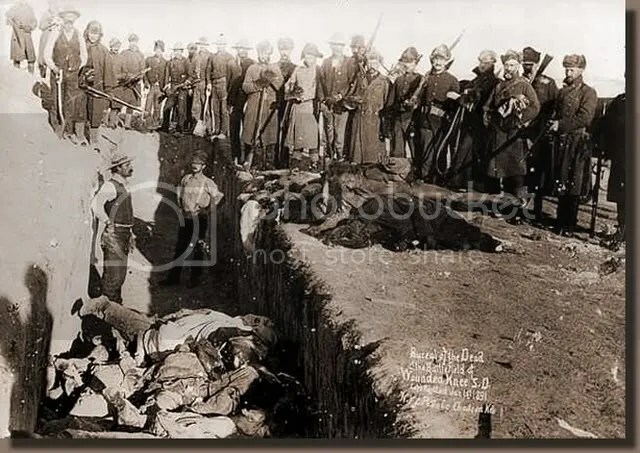 The Wounded Knee Massacre may not have been the last battle, and quite possibly resulted in total cultural annihilation. Another justification for my saying so, is that the response by the U.S. military and government was simply shameless, and viewed itself guilty of no wrongdoing. initiated at the behest of Congress, written by General E. D. Scott. This is what the white officials 116 years ago were so afraid of: religious freedom and outward expressions of grief. Possibly witnessing the Ghost Dance triggered their own death denial. As the crowd gathered about the tree the high priest, or master of ceremonies, began his address, giving them directions as to the chant and other matters. After he had spoken for about fifteen minutes they arose and formed in a circle. As nearly as I could count, there were between three and four hundred persons. One stood directly behind another, each with his hands on his neighbor’s shoulders. After walking about a few times, chanting, “Father, I come,” they stopped marching, but remained in the circle, and set up the most fearful, heart-piercing wails I ever heard-crying, moaning, groaning, and shrieking out their grief, and naming over their departed friends and relatives, at the same time taking up handfuls of dust at their feet, washing their hands in it, and throwing it over their heads. Finally, they raised their eyes to heaven, their hands clasped high above their heads, and stood straight and perfectly still, invoking the power of the Great Spirit to allow them to see and talk with their people who had died. This ceremony lasted about fifteen minutes, when they all sat down where they were and listened to another address, which I did not understand, but which I afterwards learned were words of encouragement and assurance of the coming messiah. To conclude this portion and comprehend the dire situation the Sioux Nation faced more completely, the Dawes Act and a notorious figure must be discussed: John McLaughlin, who was called White Hair. Dawes was convinced that the white man’s ways were superior to the historical ways of the Native Americans and he gainsayed the idea of communal property, although he did express sympathy for the Natives themselves. “The common field is the seat of barbarism, while the separate farm is the door to civilization,” he said. Dawes explained that selfishness was the root of advanced civilization and he could not understand why the Native Americans were not motivated to possess and achieve more than their neighbors. Section One authorizes the President to survey Native American tribal land and divide the arable area into allotments for the individual Native American. It says that the head of any household will receive 160 acres (647,000 m²), and each single individual above the age of 18 and each orphan will receive 80 acres (324,000 m²), and each minor will receive 40 acres (162,000 m²). to, and the misery that it would bring to his people. No wonder the preachers “did not deal with such recondite matters as the doctrines contained in Matthew,” they would have been morally obligated to preach against the extermination of the indigenous people. This entry was posted on Saturday, October 6th, 2007 at 7:51 am and is filed under Uncategorized. You can follow any responses to this entry through the RSS 2.0 feed. Responses are currently closed, but you can trackback from your own site.